Urinary bladder carcinoma stage T1 is an unpredictable disease that in some cases has a good prognosis with only local or no recurrence, but in others can appear as a more aggressive tumor with progression to more advanced stages. The aim here was to investigate stage T1 tumors regarding MDM2 promoter SNP309 polymorphism, mutations in the p53 gene, and expression of p53 and p16 measured by immunohistochemistry, and subsequently relate these changes to tumor recurrence and progression. We examined a cohort of patients with primary stage T1 urothelial carcinoma of the bladder and their tumors. After re-evaluation of the original slides and exclusions, the study population comprised 141 patients, all with primary stage T1 urothelial carcinoma of the bladder. The hospital records were screened for clinical parameters and information concerning presence of histologically proven recurrence and progression. The paraffin-embedded tumor material was evaluated by immunohistochemistry. Any mutations found in the p53 gene were studied by single-strand conformation analysis and Sanger sequencing. The MDM2 SNP309 polymorphism was investigated by pyrosequencing. Multivariate analyses concerning association with prognosis were performed, and Kaplan-Meier analysis was conducted for a combination of changes and time to progression. Of the 141 patients, 82 had at least one MDM2 SNP309 G allele, and 53 had a mutation in the p53 gene, but neither of those anomalies was associated with a worse prognosis. A mutation in the p53 gene was associated with immunohistochemically visualized p53 protein expression at a cut-off value of 50%. In the group with p53 mutation Kaplan-Meier analysis showed higher rate of progression and shorter time to progression in patients with immunohistochemically abnormal p16 expression compared to them with normal p16 expression (p = 0.038). 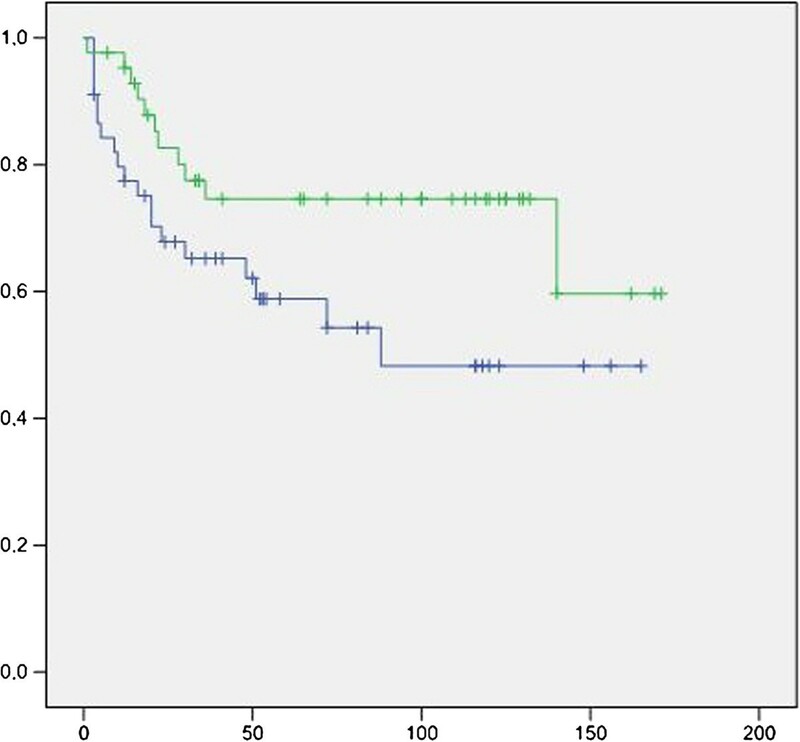 MDM2 SNP309 promoter polymorphism and mutations in p53 were not associated with worse prognosis in this cohort of patients with primary stage T1 urinary bladder carcinoma. However, patients with abnormal p16 expression and a mutated p53 gene had a higher rate of and a shorter time to progression, and p53 gene mutation was associated with an abnormal immunohistochemistry for p53 at a cut-off of 50%. Urothelial carcinoma of the bladder (UCB) is an unpredictable disease, and this is particularly apparent in patients with stage T1 UCB, who are at high risk of progression (30–50%) [1, 2]. The main treatment for non-muscle-invasive bladder cancer (NMIBC) is transurethral resection (TUR) combined with intravesical instillation of bacillus Calmette-Guérin (BCG). Cystectomy is the treatment of choice in patients with a higher stage of UCB (≥ T2), in spite of cystectomy, the prognosis is poor for these patients . Cystectomy can be considered for NMIBC stage T1, however, performing cystectomy in every new case of stage T1 UCB is overtreatment, and hence it is an essential assignment to identify markers that can assess prognosis and aid individualization of treatment [4, 5]. The molecular mechanism of tumor progression in UCB is poorly understood. Several studies have tried to explain the transformation from normal to malignant urothelium and the progression that is often seen in this disease . It is known that UCB is strongly associated with alterations in the p53 pathway . Mutations in the p53 gene are often correlated with higher tumor grade and more advanced stages, as well as progression of NMIBC to muscle-invasive disease . The murine double minute 2 (MDM2) is a negative regulator of p53. Furthermore, MDM2 SNP 309 (rs2279744) promoter polymorphism has been reported to be a risk modifier in several other malignant neoplasms , but few studies have addressed the role of this as such a modifier in UCB, which indicates the need for further research on this subject . MDM2 and p53 play a critical role in carcinogenesis [11, 12]. The latter is encoded by the p53 tumor suppressor gene, and it induces cell cycle arrest, apoptosis, DNA repair, and prevention of angiogenesis [13–15]. The p53 gene is often mutated in malignancies, which highlights its importance in tumor development and progression. MDM2, on the other hand, is an essential negative regulator of p53, because, when present in excessive amounts, it reduces the activity of p53 via enhanced proteasomal degradation [12, 16]. A single-nucleotide polymorphism (SNP309, rs2279744) located in the first intron of the core promoter region of the MDM2 gene affects binding of the transcription factor Sp1. Sp1 binds with higher affinity to the G allele than to the T allele, which results in increased transcription of the MDM2 gene and higher levels of MDM2 protein, and thereby inhibits the tumor suppressor function of p53 . The interaction between p53 and MDM2 is a target for therapeutic intervention, and several such drugs are under development or in clinical trials [18–20]. We have previously investigated clinical and histopathological parameters, as well as immunohistochemistry (IHC) for proteins involved in cell cycle regulation ( i.e. p53, p21, pRb, p16, and cyclin D1) and for matrix metalloproteinases [21, 22]. In those studies, we found that normal p53 (cut-off < 10%) was significantly associated with recurrence, and abnormal p16 was associated with progression. It is plausible that the mechanism for the latter relationship is dependent on the step involving phosphorylation of Rb. The importance of these proteins in tumor development has been described by other researchers [23–25]. In the current study, we examined a population-based cohort of patients with primary stage T1 UCB. We analyzed possible effects of the functional polymorphism SNP309 in the MDM2 gene, and investigated the relationship between that polymorphism and mutations in the p53 gene. We also evaluated the expression of p53, p16, pRb and p21 measured by IHC. All findings were evaluated regarding associations with the risk of progression and recurrence. This population-based retrospective study included all patients reported in 1992–2001 to the regional Bladder Cancer Registry of the Southeast Healthcare Region in Sweden as having primary stage T1 UCB. The hospital records were reviewed to collect information concerning tumor characteristics (size and multiplicity), treatment modalities, and outcome in relation to histologically proven recurrence and/or progression, as well as eventual death from UCB. Definition of progression was recurrence with infiltration to T2 or more, regional lymph node involvement, distant metastasis, or death from bladder cancer. Re-evaluation was done by one uropathologist (HO) on the original hematoxylin-eosin-stained slides with respect to T stage , WHO grade , presence of concomitant carcinoma in situ, and lymphovascular infiltration (LVI) [28, 29]. Presence of muscularis propria was required for inclusion in the study. After the re-evaluation, paraffin blocks were selected for sectioning of new tumor material for further evaluations (see below). The study cohort initially consisted of 285 patients, and 141 remained after re-evaluation, reviewing of the hospital records, and performance of the laboratory analyses. One important reason for exclusion was a changed diagnosis in the re-evaluation (n = 52; 50 changed to Ta and two to T2). Furthermore, seven patients had missing specimens (both tissue blocks and slides), and 15 had insufficient information in their hospital records (e.g., absence of tumor characteristics and/or details of follow-up). In addition, due to a combination of poor tumor quality and methodological difficulties in processing old formalin-fixed tumor material for genetic analyses, tumor material from 70 patients was excluded from further laboratory analyses. In general, these 70 patients did not differ substantially from the 141 that remained, although, when we compared these two groups, we noted significant differences with regard to age and p21 expression measured by IHC (Table 1). When screening the hospital records, we found that early re-resection, 4–6 weeks after initial TUR, was not stipulated as mandatory during the period that the studied material was collected, and hence this procedure had been performed on only a very small number of patients (included during the last years of the study period). The presence of a tumor at a re-resection was considered to be a recurrence. Random biopsies of normal mucosa were not performed routinely, and no patient had received intravesical BCG or chemotherapy before recurrence. IHC was performed on 4-μm whole sections from the original formalin-fixed, paraffin-embedded tissue blocks. The blocks were carefully chosen, paying special attention to large tumor volume and good fixation. The sections were deparaffinized in xylene and then rehydrated, pretreated with Tris-EDTA buffer (pH 9), and stained in an automated immunostainer (DAKO TechMate-TM Horizon, DAKO Denmark A/S). For detection, we used monoclonal mouse antibodies (Table 2). Appropriate positive and negative controls were employed throughout. The antibodies were initially individually optimized with respect to the best pretreatment method and dilution. The expression levels were determined semi-quantitatively based on the fraction of tumor cells showing positive staining (0%, 1–10%, 11–25%, 26–50%, 51–75%, 76–100%). P53 was considered as abnormal when >10% positive tumor cells, p16 was considered abnormal when no (0%) or >50% positive tumor cells were found. For p53 and p16, both nuclear and cytoplasmic staining was considered as positive, although no single cases existed which just were cytoplasmic positive without being nuclei positive (see Figure 1). The cut-off values were chosen from the literature (Table 2) [30–32]. Positive (abnormal) immunohistochemical staining for p53 (left) and p16 (right) in urinary bladder carcinoma cells. IHC stainings for the proteins pRb and p21 were also performed using the same method as described above, and has previously been reported by our group . Two 10-μm-thick sections obtained from the original paraffin blocks were transferred to an Eppendorf tube, and DNA was purified according to the protocol provided in the Maxwell TM 16 FFPE DNA Purification Kit (Promega, Madison, WI, USA). To detect SNP309 (rs2279244), the MDM2 gene was amplified by a PCR carried out in a reaction volume of 30 μl containing (final concentrations) 20 mM (NH4)2SO4, 75 mM Tris–HCl (pH 9.0), 0.01% Tween 20, each dNTP at 200 μM, 2.0 mM MgCl2, each primer (available on request) at 1.0 μM (Invitrogen, Paisley, UK), 0.5 U Taq DNA polymerase (Thermowhite, Saveen Werner AB, Limhamn, Sweden), and 50 ng of DNA. The amplification was performed at an annealing temperature of 60°C for 35 cycles, and the reverse primer was biotinylated. Single-stranded DNA was isolated from the PCR reaction using a Pyrosequencing Vacuum Prep Workstation (Biotage AB, Uppsala, Swden) and then transferred to a 96-well plate. The sequencing primer was annealed to the single-stranded DNA by heating the sample to 80°C for 2 min and subsequently allowing it to cool to room temperature. Thereafter, the plate was placed in the Pyrosequencing PSQ96MA system (Biotage AB, Uppsala, Sweden) for real-time sequencing and SNP detection. Blood samples randomly collected from a population of 725 healthy individuals (registered in our database) living in the same region as the study population were tested for MDM2 polymorphism and served as references for the frequency of such polymorphism. Tumor DNA was analyzed for mutations in exons 5–8 in the p53 gene. PCR primers (available on request) covering the same exons and including exon/intron borders of the p53 gene were used to generate PCR products from tumor DNA. After confirming the success of the PCR, a 1-μl aliquot of the PCR product was labeled with 32P-dATP in 5–10 cycles of secondary PCR using the same primers as in the primary PCR and then subjected to single-strand conformation analysis (SSCA) [33, 34]. Labeled PCR products were diluted 20-fold with 50% formamide/10 mM EDTA/0.1% SDS (containing xylene cyanol and bromophenol blue tracing dyes). After denaturation at 95°C for 5 min, the samples were immediately put on ice and loaded on a native 6% polyacrylamide gel containing 10% glycerol. Electrophoretic separation of single-stranded DNA was performed at 10–12 W for 16–20 h. Thereafter, the gels were attached to filter paper and dried, and then exposed to x-ray film for 16–24 h. Shifted bands (indicating a different secondary structure) were excised, and DNA was eluted and used in a re-amplification PCR reaction for direct DNA sequencing. A 3–5-μl aliquot of PCR product (collected directly or from re-amplification of excised SSCA bands) was used in a standard protocol for fluorescently labeled dideoxynucleotides (BigDye, Applied Biosystems, Life Technologies), with injection into a capillary electrophoresis instrument (ABI 3500, Life Technologies) for separation and detection. The sequences that were obtained were compared with the reference sequence NC 000017 (http://www.ncbi.nlm.nih.gov), and deviations were recorded as mutations or polymorphisms. The identified mutations were confirmed by re-analysis (according to the entire procedure) from a second PCR amplification of the tumor DNA. Descriptive statistics were used for frequencies of mutations in p53 and MDM2 polymorphism. Associations between such mutations and polymorphism on the one hand and clinicopathological and immunohistochemical variables on the other were calculated by the chi-square test. Cox proportional hazards analysis was performed in a univariate and a multivariate fashion to investigate variables in relation to recurrence and progression in UCB, and to test for potential confounding variables and interactions. The results of the Cox regression are presented with hazard ratios and 95% confidence intervals. Kaplan-Meier curves were used to analyze the relative influence of IHC-determined p16 status and p53 mutations on progression and differences were calculated with the Log rank test. All statistical analyses were performed using IBM/SPSS version 19.0. P-values of ≤ 0.05 were considered to be statistically significant, and all tests were two sided. The 141 patients in the study population had a median age of 73 years (range 42–93 years) and 25 (18%) were women. Of the 141, 115 (82%) had recurrence, and 53 (38%) had progression. The intention was to follow all patients for at least 10 years. The median observation time was 65 months (4–192). The characteristics of the study-population are given in Table 3. In all, 53 (38%) of the 141 tumors we investigated had a mutation in the p53 gene, but there was no apparent prevalence in any particular exon, as outlined in Table 4. The frequencies of the MDM2 SNP309 genotypes among the 141 patients were as follows: 59 T/T (42%), 64 T/G (45%), and 18 G/G (13%). The corresponding rates in our database of 725 healthy individuals tested for MDM2 polymorphism are 41%, 45%, and 14%, respectively. Thus the proportion of G/G individuals is nearly the same in our bladder cancer cohort and the healthy subjects. Furthermore, the genotypes are in Hardy-Weinberg equilibrium, and there is no unfavorable factor in MDM2 polymorphism that promotes development of UCB stage T1. We observed a significant association between p53 mutations and p53 IHC at a staining cut-off of 50% (Chi square 8.67, p = 0.003), whereas no such relationship was seen at cut-off values lower than 50% (10%, 25%, or < 50%). There was also an association between abnormal p16 expression and p53 mutations (Chi square 4.74, p = 0.029), and between WHO tumor grade 2 (but not to grade 3) and p53 mutations (Chi square 6.12, p = 0.013) (data not shown). However, it should be noted that there were only 21 grade 2 tumors in the material. No association was found when we analyzed MDM2 polymorphism and p53 mutations in relation to prognosis. Table 5 summarizes the results concerning progression in relation to IHC, MDM2 polymorphism and p53 mutations (data for recurrence not shown). In patients with a p53 mutation, Kaplan-Meier curves showed a higher progression rate and a shorter time to progression for those with abnormal p16 expression as compared to those with normal p16 expression (Log rank chi square 4.32, p = 0.038; Figure 2). For patients who lacked a p53 mutation, no significant difference was found between those with normal and abnormal p16 expression (Log rank chi square 3.78, p = 0.052; Figure 3). However, in the whole group of UCB patients, there was an association between IHC-abnormal p16 alone and UCB progression, as previously reported by our group . Kaplan-Meier curves for patients with a p53 mutation showing that the time (months) to progression was significantly shorter for those with abnormal (blue curve) as compared to normal (green curve) p16 expression. (Log rank chi square 4.32, p = 0.038). Kaplan-Meier curves for patients without a p53 mutation showing that time (months) to progression was shorter for those with abnormal (blue curve) p16 expression as compared to those with normal (green curve) p16 expression, although this difference was not statistically significant. (Log rank chi square 3.78, p = 0.052). No association was found for pRb or p21 IHC on one side, and MDM2 polymorphism or p53 mutations on the other. SNP309 is a common polymorphism in the regulatory region in intron 1 of MDM2, and it might influence the cellular levels of the p53 protein and thereby promote tumor development and progression . This has been observed in several studies concerning poor outcome of various malignancies, such as lung cancer, breast cancer, gastric carcinoma, and renal cell carcinoma [35–38]. The role of a single nucleotide polymorphism in MDM2 (i.e., SNP309) has also been evaluated in UCB, but the results have varied [10, 39]. Here, we studied a large well-characterized group of patients with primary stage T1 UCB, none of whom had received intravesical BCG or chemotherapy before recurrence, a treatment strategy that is mandatory today. Accordingly, these patients exhibited a natural course of stage T1 UCB and were therefore ideal to investigate in the present context. We found that neither MDM2 polymorphism nor p53 gene mutations were associated with tumor progression in this study population. However, there was an association between strong IHC-determined p53 expression and p53 gene mutations. It is debatable whether p53 mutations can be compared with p53 expression measured by IHC. Yemelyanova et al. observed concordance between p53 gene mutations and IHC-detected p53 expression in ovarian carcinoma patients, and those investigators obtained statistically significant results at a cut-off value of 60% positive tumor cells. That value is higher than the cut-off that is usually reported as abnormal for p53 expression, which is most often 10% positive tumor cells . In our investigation, a cut-off value of 50% was found to be associated with mutations, and it may reflect the mutational status of p53 more accurately than the conventional cut-off value used for the p53 protein. For analysis of p53 mutations, Sanger sequencing with fluorescent dideoxynucleotides is usually not sufficiently sensitive in detecting small fractions of mutated cells, and therefore we also performed SSCA. The results showed nearly 100% agreement between SSCA mobility shifts and Sanger sequencing of excised and re-amplified SSCA bands. We found an association between abnormal p16 expression and mutations in p53, which may be evidence of linkage between the p53, p16, and pRb proteins. Furthermore, this observation is supported by the results of Kaplan-Meier analysis indicating that the rate of progression and time to progression were significantly shorter in patients with IHC-abnormal p16 and p53 mutations. Moreover, we observed that abnormal expression of p16 alone seems to be associated, with a worse prognosis, which has also been reported previously by us and by other authors [21, 32, 42, 43]. MDM2 polymorphism in the current UCB patients was tested in DNA from tumor tissue, and hence there was a risk of bias due to chromosomal deletions on chromosome 12 (where MDM2 is located). However, chromosomal 12 deletions are not common in this disease, and all of the tissue specimens analyzed in our study contained normal cells, which ensured correct genotyping. Furthermore, the frequency of MDM2 polymorphism in the UCB patients, did not differ from that noted in our reference population, and it was in Hardy-Weinberg equilibrium, which suggests that such polymorphism is stable during tumor development, and consequently there is no difference between benign and malignant cells. Alhopuro et al. studied patients with leiomyosarcoma, colorectal cancer, and squamous cell carcinoma of the head and neck, and their results indicated essentially the same proportion of individuals with MDM2 polymorphism as noted in our investigation. Alhopuru and coworkers also reported that a healthy reference population and tumor material from their study population had approximately the same frequencies of MDM2 polymorphism. Onat et al. analyzed MDM2 polymorphism in bladder cancer and found an association between development of the disease and MDM2 polymorphism in patients with the G/G genotype. The frequency of MDM2 G/G in their study was somewhat greater in the tumor population than in the control group consisting of healthy individuals, although the values those researchers obtained differ very little from the levels noted in our investigation. In an assessment of B-CLL patients, Willander et al. 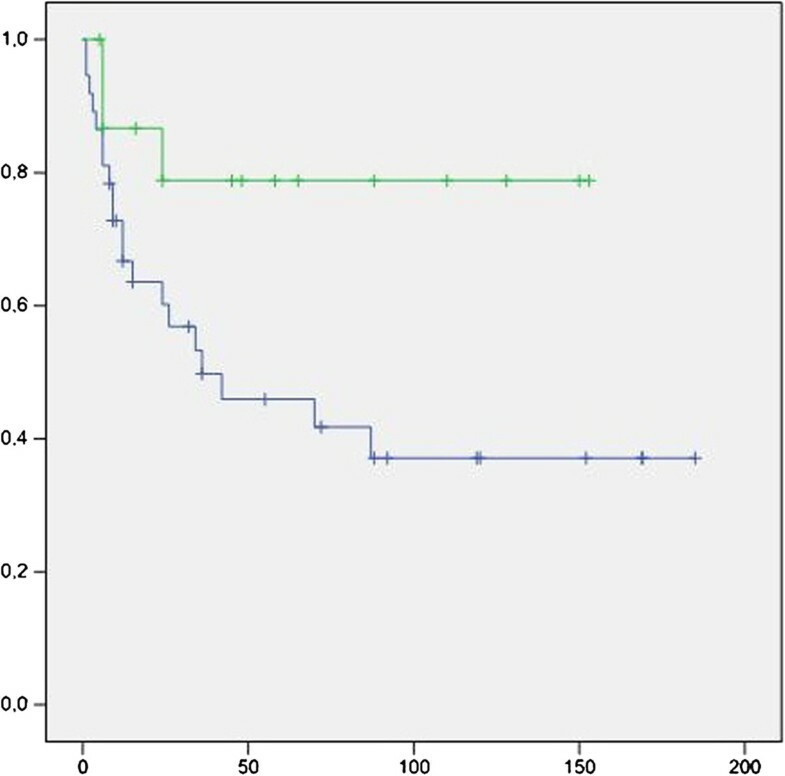 found that overall survival was poorer in the subjects with one or two G alleles compared to those with T/T. However, the overall frequencies of G/G, T/G, and T/T found by those investigators are equivalent to the corresponding figures recorded in our study, which underlines that the MDM2 gene is probably rather stable throughout tumor development and that one or two G alleles more likely only play a role as an unfavorable genotype. Several studies have examined p53 and MDM2 polymorphism in UCB. In one of those investigations, Lu et al. found that 61 (44%) of 140 patients with the disease were wild type for p53, whereas the corresponding proportion in our cohort was 62%, and this disparity may reflect difference in T stages between the two studies. A plausible explanation for this is that the tumors investigated by Lu and colleagues were from cystectomy specimens and thus represented higher tumor stages with more p53 mutations (less wild-type p53). Notably, we focused on exons 5–8 in the p53 gene, whereas Lu et al. investigated exons 2–11, although only a small number of the mutations in their study were found outside exons 5–8. Furthermore, Hernandez et al. found a frequency of 65.5% p53 mutations in a group of patients with stage T1 grade 3 UCB, but those mutations were not associated with prognosis; interestingly, exons 4–9 were evaluated in that investigation, but the majority of the mutations were found in exons 5–8. The frequency of p53 gene mutations varies considerably in the literature, which may reflect the general heterogeneity of stage T1 UCB as a type of malignancy. It is possible that mutations in this gene play a role in the development and progression of T1 UCB, but the definitive pathways have not yet been completely elucidated. Polymorphism in MDM2 (SNP309) and mutations in p53 were not associated with worse prognosis in this population-based cohort of patients with stage T1 UCB. Mutations in p53 were associated with an IHC cut-off value of 50% for the p53 protein. Patients with IHC-abnormal p16 and p53 mutations had a higher rate of progression and a shorter time to progression. We thank laboratory technicians Annette Molbaek and Åsa Schippert for assistance. HO and SJ planned the study and were responsible for the design, coordination, and drafting the manuscript. PH and PS participated in the study design and helped draft the manuscript. JR and SJ performed the statistical analysis. PS and HO were responsible for the methodological issues involved in this study. All authors read and approved the final manuscript.